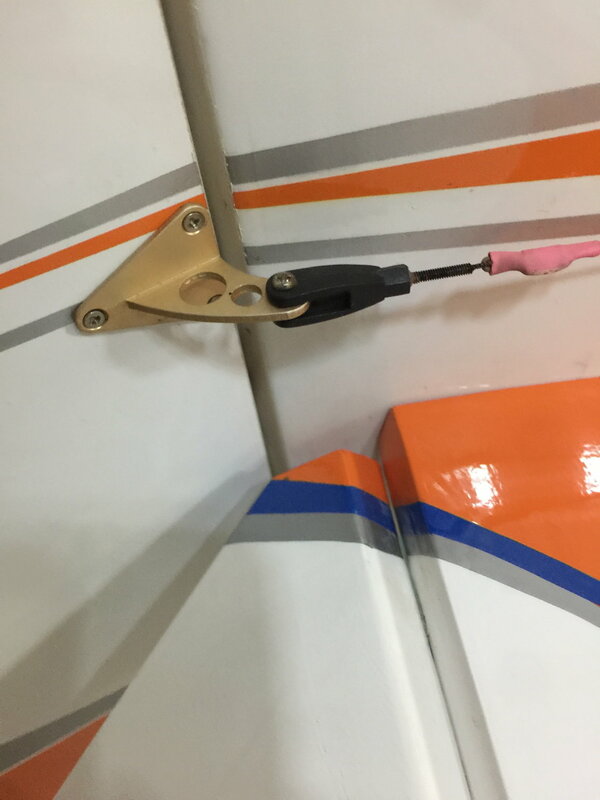 I have never used pull-pull with wires for rudder in my F3A planes. But now I will change on my Galactika plane to pull-pull since I need to move the rudder servo to the front for center of gravity reasions. need to be moved to the front. If You have any advice to give me (and others) that do pull-pull for the first time in a 2M F3A model please post in this thread. I'm particular intgerested in proven suitable wire and sutable ball-links solutions. As light as possblle but without compromising needed strength. If You know some sourses to buy the needed hardware, that is welcome also. I have seen that Secraft has pul-pull solutions but it might be a little too beefy and heavy for our use, and Little heavy also. 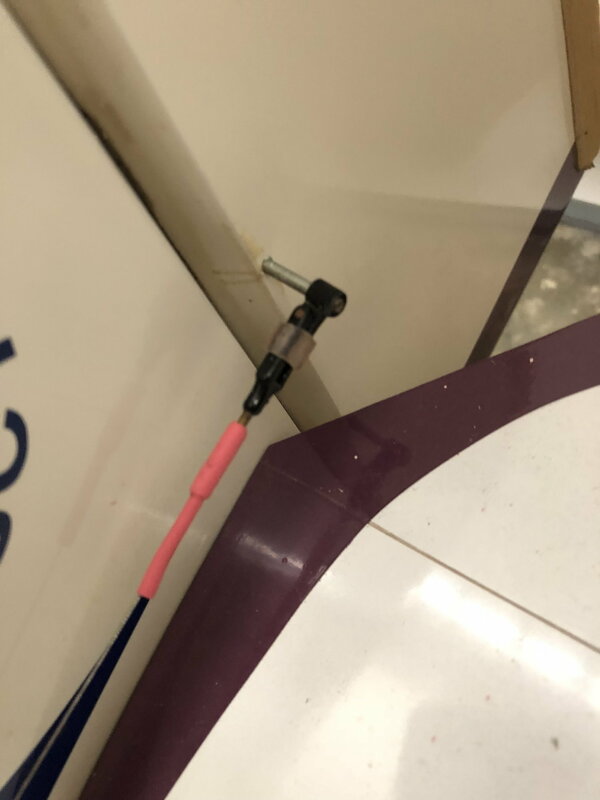 I found an image (see last iimage below) on internet with a pull-pull solution that might be suitable but I do not know what brand it is. used for the old rudder tubes. 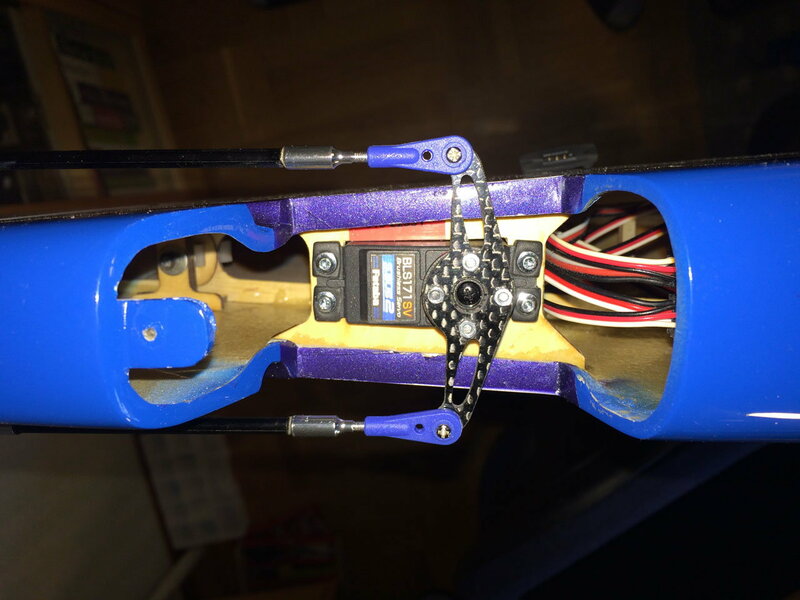 It is quite much weight (plywood tray, servo Futaba BLS171SV 48 gram/1.7 oz, S.BUS2 hub+plate) in the tail on my Galactika. I would not be surprised it is total 60 gram that will be taken out of the tail weight. 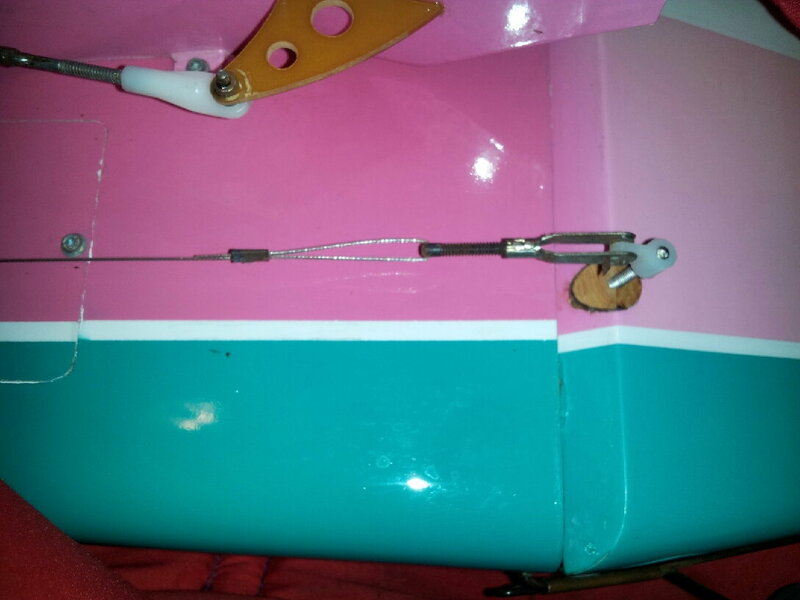 I will try to mount the rudder servo in front as much forward as it can be mounted. The flight battery I use today weight about 1160 gram (Hacker Top Fuel Eco-X 5000 mAh). New flight battery will probably be Hacker TopFuel ECO-X 4600 mAh Competition F3A 2017, 970 gram. My goal is to get my Galactika close to 200 gram lighter. Old carbon tubes to rudder. Present Futaba BLS171SV servo and servo arm in tail of my Galactika. Present S.BUS2 hub in tail of my Galactika. 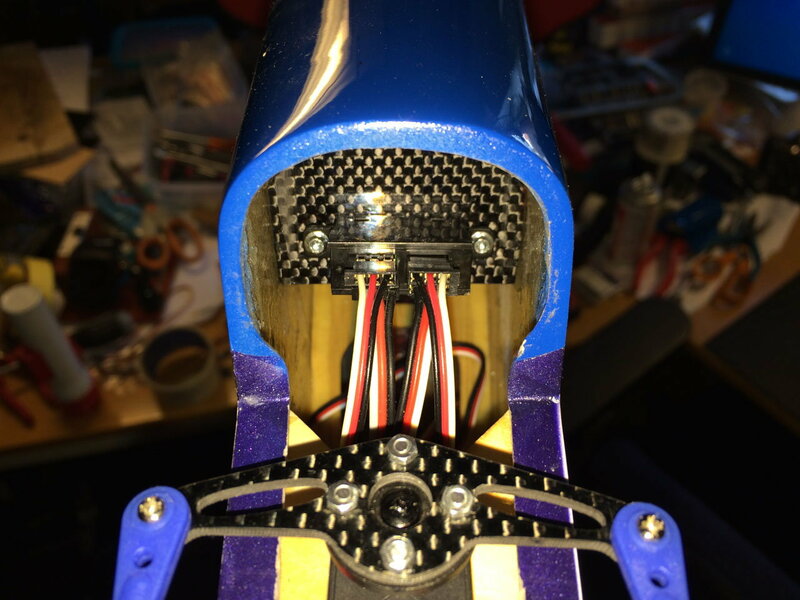 Rudder servo will me moved to new location somewhere between the wing adjusters. 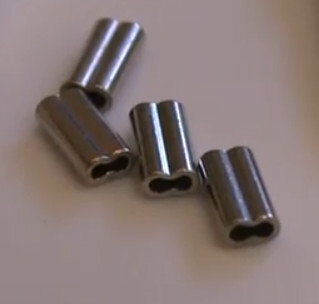 Exemple of pull-pull hardware that might be suitable - what brand ? Last edited by bem; 04-02-2018 at 02:11 AM. There are quite a few cable pull/pull systems out there. I build my own using cable fishing leader material and the crimps that go along with the cable. Any good fishing outlet should have that on hand. 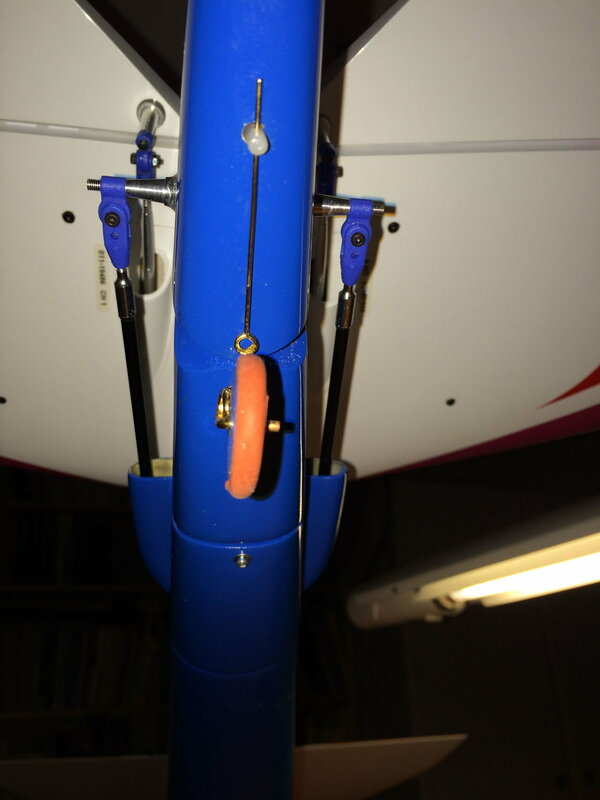 I use regular clevises for the connection to the rudder. Here are a couple DuBro systems. Use these https://www.f3aunlimited.com/secraft-wire-tensioner-red and good wire from the dubro system and it will be problem free. Go you your local fishing shop and purchase nylon coated stainless steel fishing wire 15-20kg. Thanks guys, some good suggestions. I wished I know where to buy these below (not the control horn, just the pull-pull linkage), that I posted a photo of in my first post. I kind of like those. I respost the photo here again, maybe somone know a supplier. Another recommendation; after you get your wire, I have even used coated fishing cable, take the wire and hang 5-10# weight with the wire and tie the ends to something secure for it to hang. Hang for about a week to let it stretch. Then install the cable. If not, the cable will stretch with usage and you will have to adjust for awhile as it stretches in the plane. You may get the following parts for the pull-pull linkage pictured in your post. MK used to offer a super light pull-pull system for 2M but I could not find it from Central Hobbies' website anymore. I would personally avoid any of the types of couplers you mentioned. The sharp edges will result in cable break as the edges will eventually cut through the cable. The steel versions are worse still and they always seem to break at the most inconvenient time. The Sullivan type I mentioned in my previous post are gentle on the cable because of the rounded shape resulting in very little cable wear over time. They look neat when done properly. Here is a picture of my setup. Last edited by PeterP; 04-03-2018 at 05:23 AM. The copper couplers probably are not sharp as the steel version and one can easily remove the sharp edges (if any) with a Dremel tool. They are not copper - Brass. Brass wears!. I stand by my advice that the Sullivan type are the best option available because of the reasons mentioned and cheap. Last edited by PeterP; 04-03-2018 at 05:42 AM. I have never experienced any cables being cut incident with the following steel coupler setup. The plane is with me for 5 seasons. Personally, I think the choice of the cable probably matters and have great success with Dubro and F3Aunlimited cables. Last edited by PeterP; 04-03-2018 at 07:10 AM. You mentioned a good point though one needs to check the cables carefully :-). Use control line wire. Doesn't stretch. Good idea, what size control line wire do you use? I was afraid someone would ask. I can't find the spool I bought about 100 years ago when Tony Frackowiak put me on to it, but my micrometer says it is .020 inch diameter. 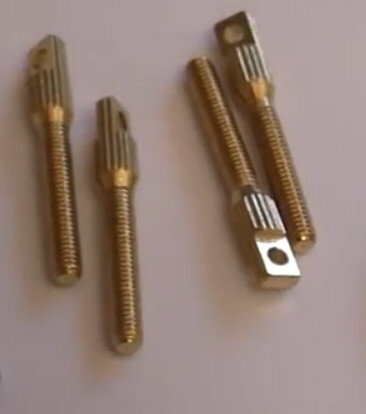 I use brass rod end couplers into conventional clevises. I fold the control line wire over and push it into the coupler and then fill it with solder. Never had one pull out. You can see by the dust I haven't flown this plane in a long time. Great advice so far, I'm sure there is more on this topic so please add more if You have. 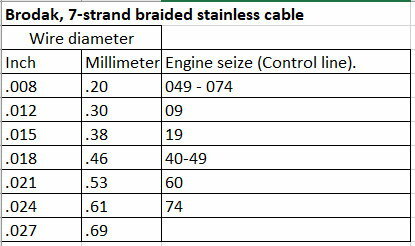 I checked Brodak control line wire (cable) and they have these wire diameter to choose from. They do not have any weight listed. What diameter do You recommend? I have noticed some cables (not Brodak) for pull-pull are coated - what advantage might that be for our purpuse? Just some extra weight in our case? If stainless wire, like Brodaks, it will be no corrosion/rust for our usage so need for coating because of that. Last edited by bem; 04-04-2018 at 12:13 AM. After some searching on the internet I have found out that the wire tensioner I have been trying to find out who makes it is used in some Hangar 9 ARF's. But I can not find it as spare part at Hangar 9. I will dig some more with help of Google. I'm not 100% sure but a 40ish size control line plane has /is supposed to be tested for about 50ish pounds of pull to be save. 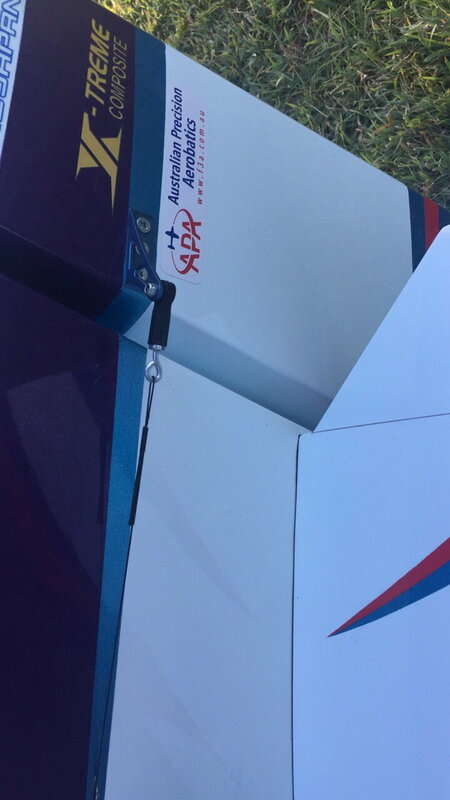 I'm sure there is that info on the AMA sight in the control line competition rules. "I have noticed some cables (not Brodak) for pull-pull are coated - what advantage might that be for our purpuse?" You can wrap the ends a couple of times and use a match to melt the coating. Then use a piece of shrink tubing to dress up the joint. Works Great! Coating also prevents metal to metal contact when using crossed wires. The best I have found for both weight and strength is using the Sullivan 2-56 eye screw and nylon coated Kevlar. The Kevlar is sold by an outfit in Ca called Aerospace Composites Products. I use 1/8" K&S aluminum tube cut into 3/8" sections as the crimp. Crimp add a drop of medium CA and then heat shrink. Bullet proof, light and won't stretch. I ordered the Sullivan kevlar pull-pull that should be here in a few days. I might need to get the 4-40 (2.9 mm) instead of the 2-56 (2.2 mm) eyebolts if I want to use my existing clevis. Last edited by bem; 04-06-2018 at 12:11 AM. Bo, I have used the Sullivan Kevlar set up as well on a 40% Extra. The only issue I saw is that it has no coating and it either has to not rub on anything or in my case, I put a sleeve of heat shrink tube where it exited the fuselage. This is a horn developed by the late Sam Turner. I've used it for many years. A dowel is drilled and tapped for 4-40 and epoxyed into a hole cut with a piece of serrated brass tube. 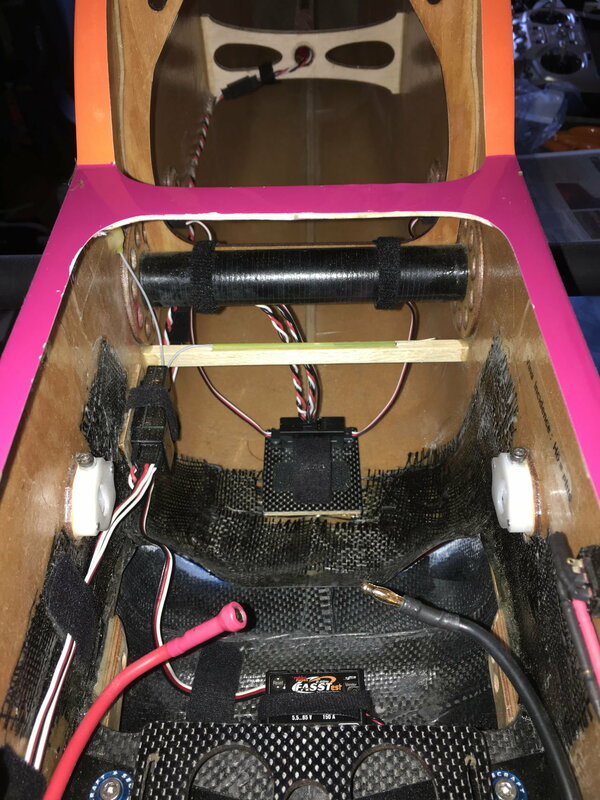 It can be slightly adjusted for centering by bending the inserted 4-40 rod and throw can be adjusted by running the aileron fitting along the rod's length.